January is National Soup Month, and there’s a lot of nutrition to receive along with the warming comfort of a good, hot bowl of soup! Soup has a long history, dating back perhaps as far as six centuries BCE. Older Germanic languages had a root verb sounding like “soup” that meant “to consume something liquid.” Ancient Greeks sold broth in public markets, and patrons dipped bread in the broth. In the 5th century AD, the Latin language had the word “suppa” to mean this bread eaten in broth. In England in the 11th century, the bread was known as “sop,” which eventually lead to our English word “soup.” The history of soups is fascinating! Soups come in many varieties. Some are water-based (such as broth or consommé), while others are milk- or cream-based (such as chowders or bisques). This second kind of soups is thicker and creamier (and often therefore more calorie-laden). Then there are stews and all the variations of chili. There are ways to make your soup recipe healthier. Consider using vegetable broth instead of meat-based, to cut down on fat calories. Or if using meat in soup, you can trim the fat before chopping up the meat (or rinse cooked hamburger in hot water to get rid of some of the grease). If you refrigerate soups before reheating to serve, the fat will rise to the top and congeal, where it can easily be scraped off and discarded. If you are used to making canned soups with milk, give them a try with water or broth instead. And remember to read the label carefully; the typical can of condensed soup is intended to make over 2 servings! Many of us simply eat the whole amount for our lunch. It is easy enough to make your own broth. Boil up the turkey carcass or ham bone, vegetable scraps and clean peels, leftover veggies (including mashed potatoes), even leftover salad (complete with dressing). Broth stores well in small containers in the freezer, ready to use whenever you make soup. Plus homemade broth is a lot healthier than purchased canned broth. Remember the sodium load in dry bouillon cubes and prepared dry soup mixes. YIKES! The packet of dry onion soup mix in my cupboard says one serving has 24% of my recommended sodium for a day. I also see that the packet makes 4 servings, so if I ate all 4 cups that the packet makes, that’s all the sodium I should have all day! Soups are also wonderful places to include vegetables (and sometimes fruit!) in your diet. Consider veggie-based soups, either homemade or canned. Then add even more vegetables, either bite-sized raw or steamed fresh veggies or pre-cooked leftovers. 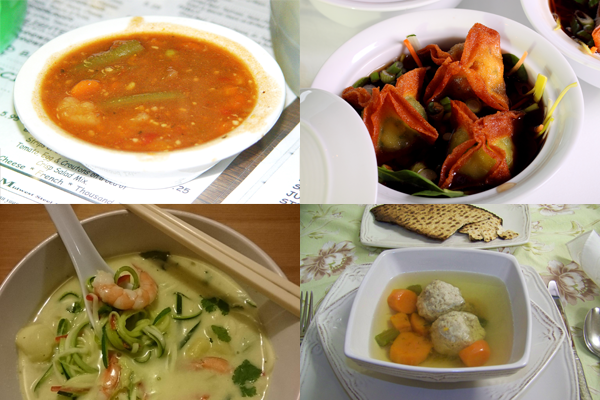 Got some good healthy soup recipes? Please share. Contact iSkye Silverweb inworld or at iskye.silverweb at gmail dot com to contribute. Babizhayev, M.A., Deyev, A. I. & Yegorov, Y. E. (2013). Non-hydrolyzed in digestive tract and blood natural L-carnosine peptide ("bioactivated Jewish penicillin") as a panacea of tomorrow for various flu ailments: signaling activity attenuating nitric oxide (NO) production, cytostasis, and NO-dependent inhibition of influenza virus replication in macrophages in the human body infected with the virulent swine influenza A (H1N1) virus. Journal of basic and clinical physiology and pharmacology, 24(1), 1-26. Parisius, L. M., Stock-Schroer, B., Berger, S., Hermann, K. & Joos, S. (2014, June 11). Use of home remedies: A cross-sectional survey of patients in Germany. BMC Family Practice, 15(116). Troisi, J. D. & Gabriel, S. (2011, June). Chicken soup really is good for the soul: “Comfort food” fulfills the need to belong. Psychological Science, 22(6), 747-753. Due to the things I am sensitive too -- not allergic but sensitive to -- foods regularly high in sodium, refined sugar, red meat, dairy or wheat. Since I have to make a slurry of nearly everything, if I want to digest it, soups are a mainstay in my food life. Uncooked, cooked or a mixture of both. I was looking forward to iSkye's presentation on soups and stews 1/10/2016, when SL went into "unexpected service maintenance". So, here's to getting the full soupy scoop from iSkye sometime next week! I love Etymology and History link-outs at the end of the blog! Great stuff!